Summary: Walk from Hebden following Hebden Beck before climbing to higher ground at Bolton Haw Crags and to Grassington Moor. 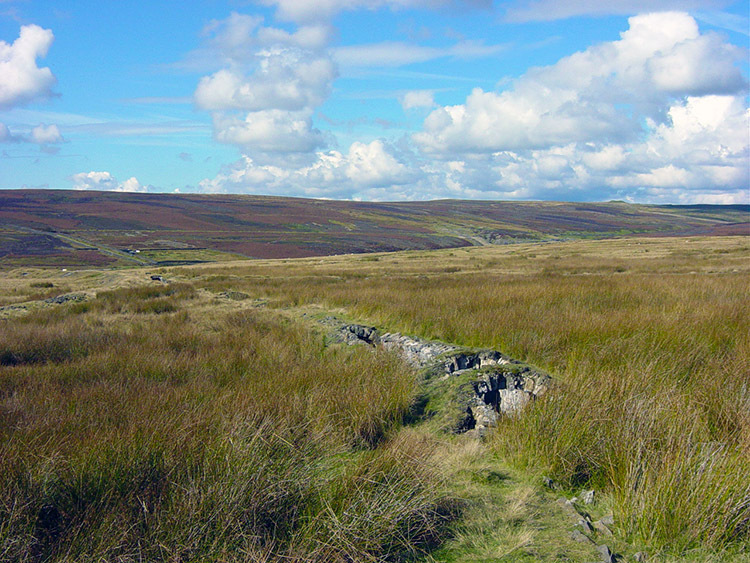 On the moor visit some old mine workings which includes good examples of stone built water culverts, an excellent old chimney and the remains of a building that once housed an enormous water wheel. There is also a small old reservoir to visit amid the many slag heaps and some very deep shafts, safely fenced off because anyone falling down one would never see the light of day again. 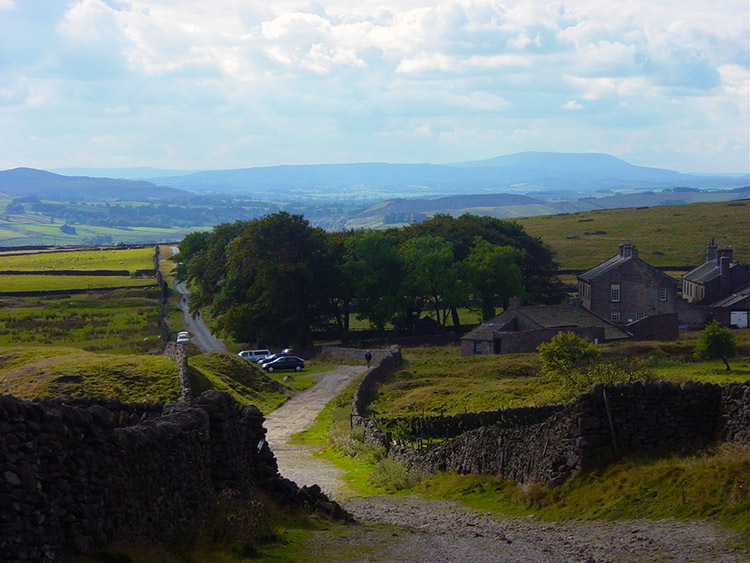 After enjoying the sites cross the moor to Yarnbury then High Barn and Bare House before dropping off the moor to Grassington. 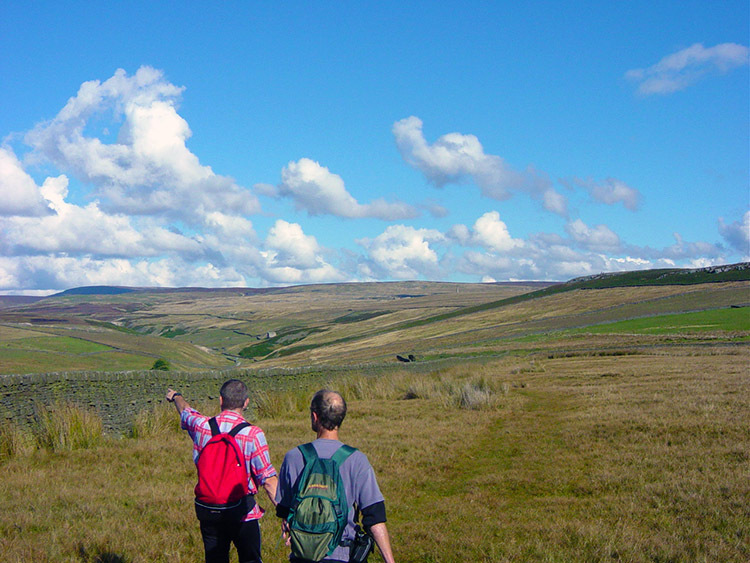 From there descend to the Wharfe and two stepping stone crossings of the river before walking back to Hebden. 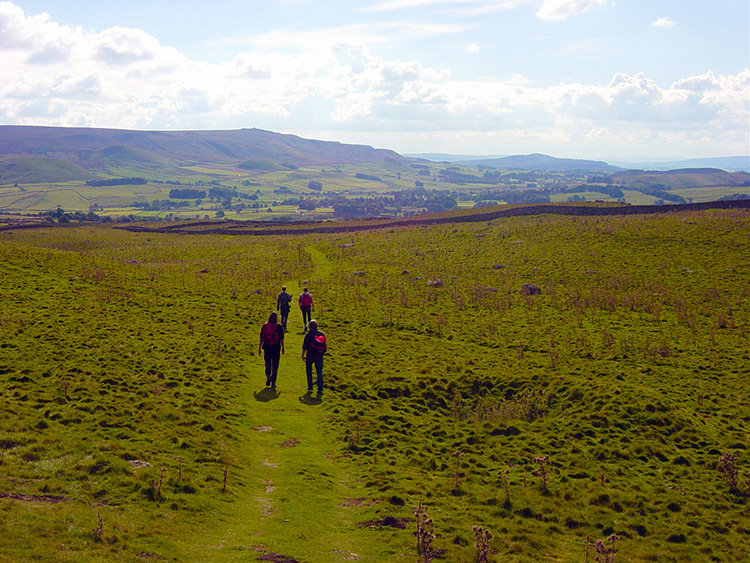 There was six of us on this wonderful day out walking which featured lots of highlights in its 10 miles. The super six were Dave, Deke, Jez, Ally, Ken and me. We had a great walk that all started with a walk out of Hebden village in a due north direction following Hebden Beck upstream. After a short while we took the option, or at least Jez did with us following to climb up from the little valley up to Bolton Haw Crags. 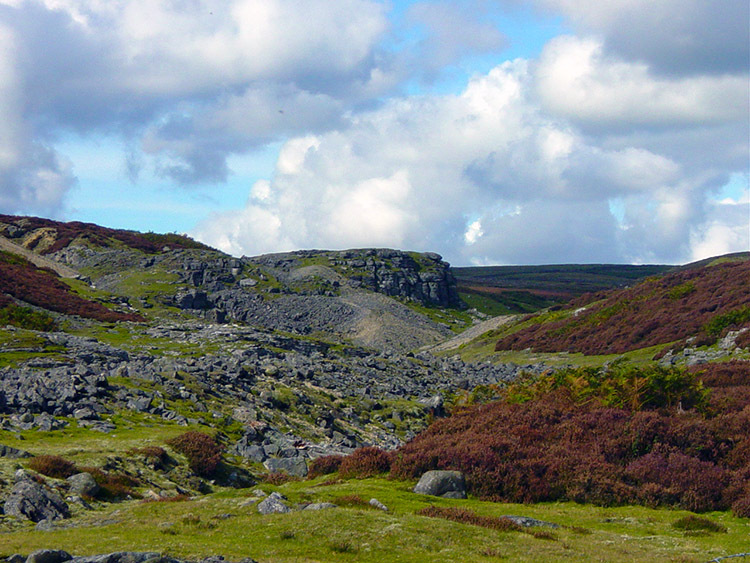 It was a good choice that Jez made for the clamber up to the top gave us our first great views of the moor. And walking up to the top of the crag was good in itself, blowing away all our weekend rustiness. Yet again we were gifted with a fine sunny day, this the last Sunday in September 2003. 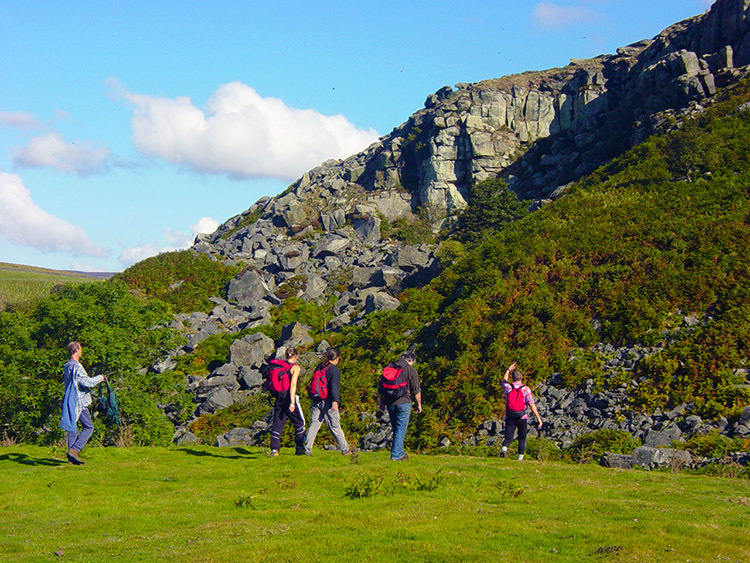 From Bolton Haw Crag we followed the contours of the moor in good springy fell walking conditions to a disused quarry at Cupola Corner. How do some of these places get their names? We tracked on from Cupola Corner in a straight line to our next goal that we just couldn't miss. 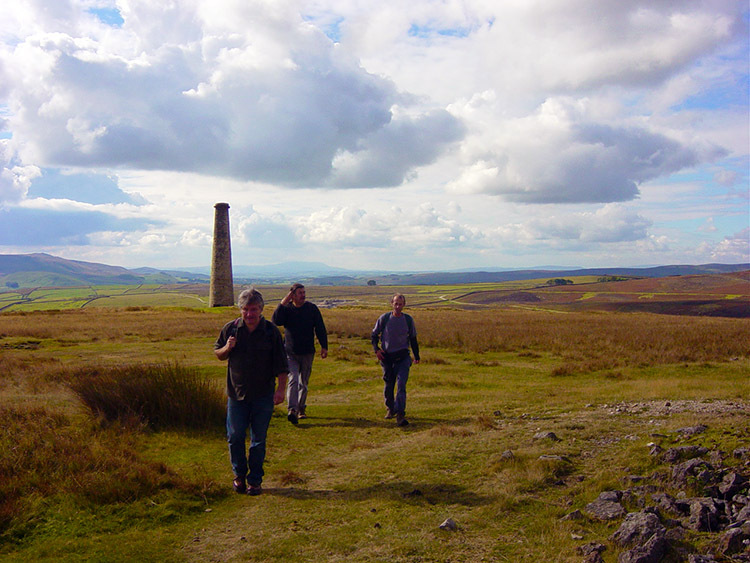 It was a magnificent example of an old mine chimney in perfect condition standing proudly on the moor at about 40 metres high. We had seen it as soon as we had hit the moor top and just had to go for it. On the approach to the chimney we inspected some great examples of stone built water culverts running parallel to each other. (what I thought were water culverts were in fact flues used in the smelting of lead ore - thanks to Don Langley for the correction) This must have been a busy site at one time but alas no more, the spoils have been taken from this hill. We stayed at the chimney for a while in celebration of its majestic standing while having our first bite to eat and a drink. Deke and Jez were a little miffed to learn Dave had not brought any Midget Gems. On leaving the chimney we came across a small reservoir and several deep shafts. 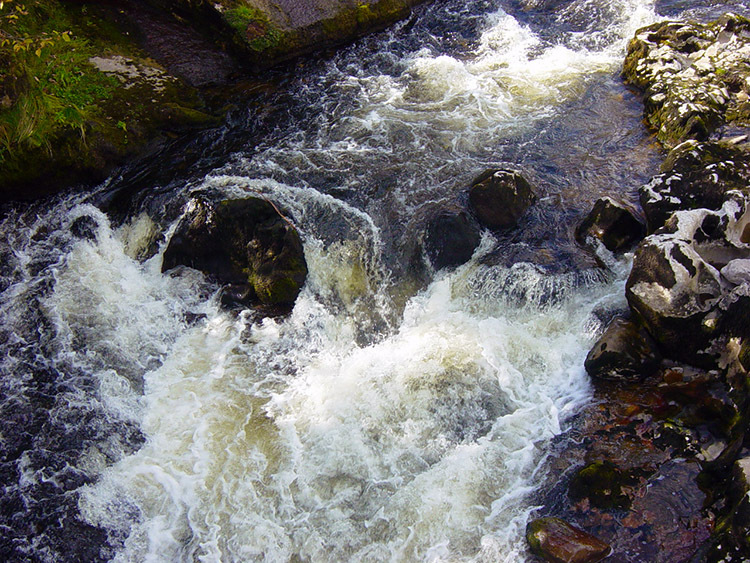 Jez demonstrated their depth by casting down a few boulders. They were deep. After our history lesson on the old mine workings we resumed the walk in earnest and followed the old workings bridleway to Yarnbury. On the way all my companions stopped to gaze over a wall. What had caught their eye? It was nothing more exciting than a deep pot hole. I suppose it would have been a scramble to get out but I have seen better examples. Made a good picture though. After the briefest of stops looking into the hole we all moved on to Yarnbury where we followed another bridleway back onto the moor towards High Barn and then Bare House where we all stopped for lunch and had a great laugh whilst doing so. Deke in particular got the uncontrollable giggles when we discussed the subject of nausea. 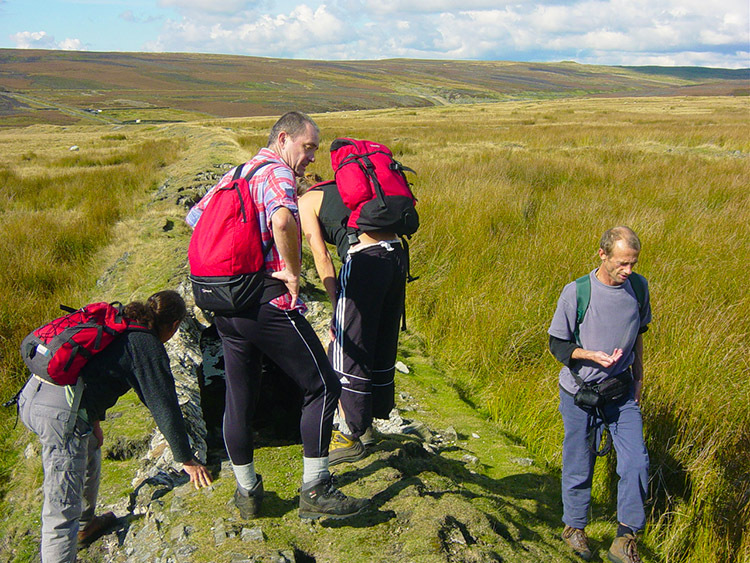 After our food, drink and good fun we then set off heading off the moor in the direction of Grassington. 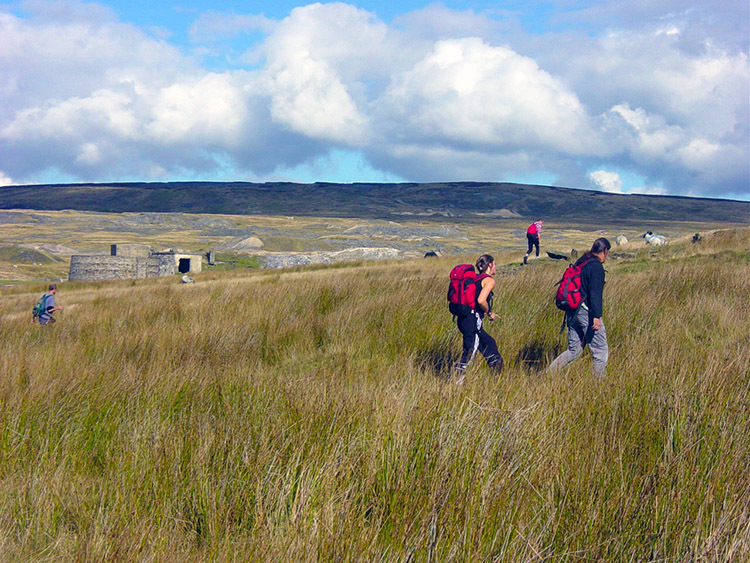 The walk from the moor to Yarnbury on the Old Moor Lane track could have been extended all the way to Grassington by following the tarmac road but not to be boring we cut off right at Yarnbury to explore another area of disused mines and shafts. 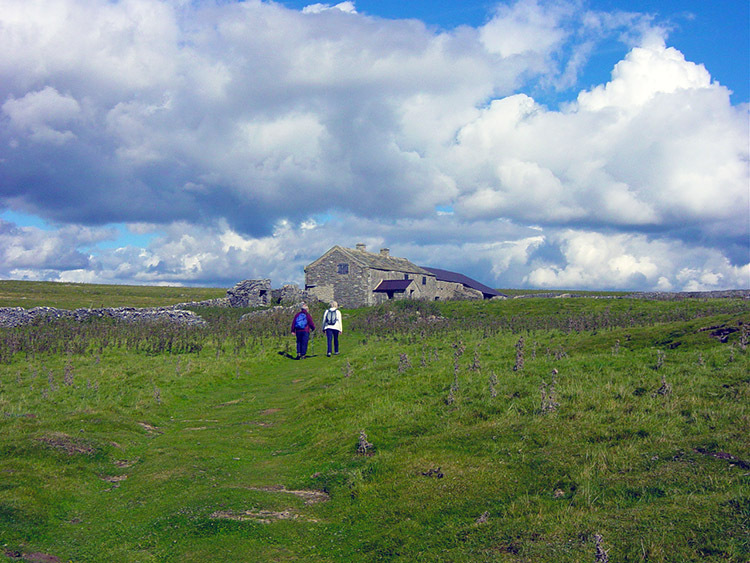 Then we continued on the walk to High Barn and from there to Bare House. The walking was gorgeous on this part of the walk. 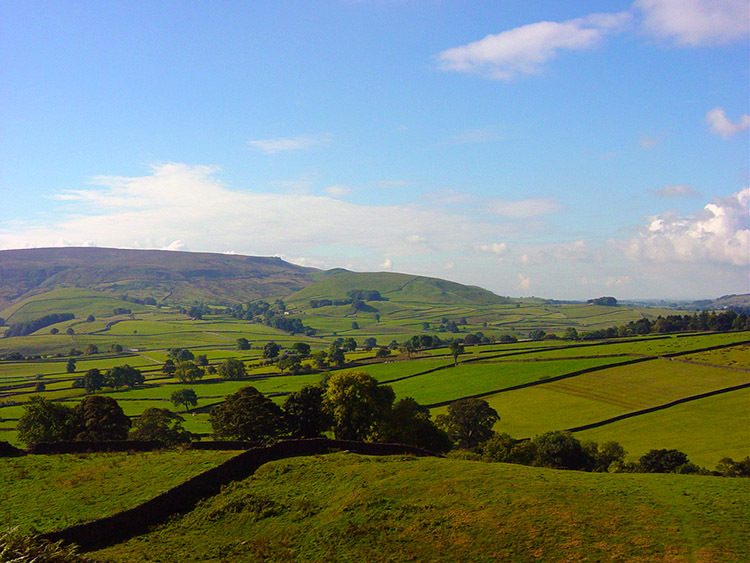 Lush fields everywhere. After passing Bare House we crossed some limestone pavements and then we visited the site of a Medieval village though we did not spot any evidence. 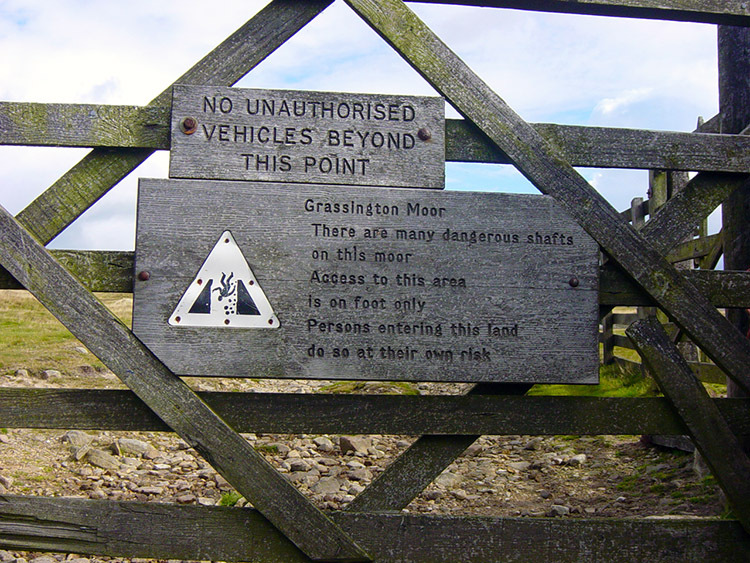 After our unfruitful search for antiquity we walked on and soon reached Grassington. 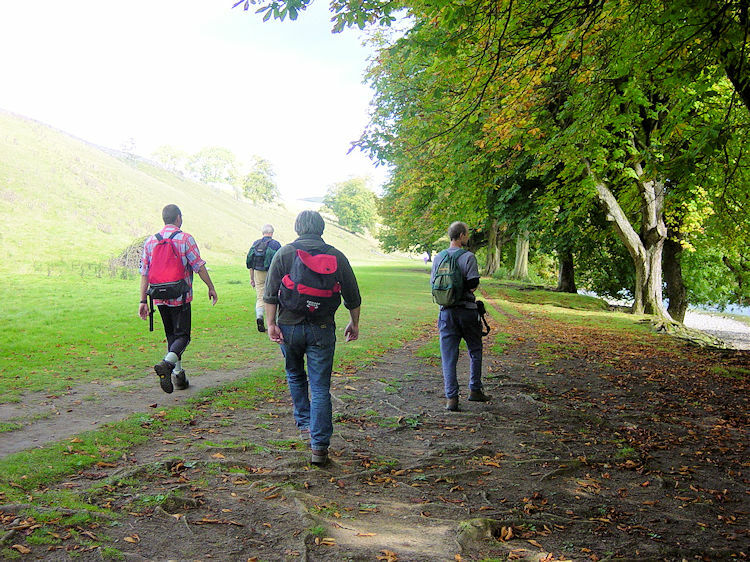 While walking through the Dales village some of the crew fancied a refreshment break while some others did not. 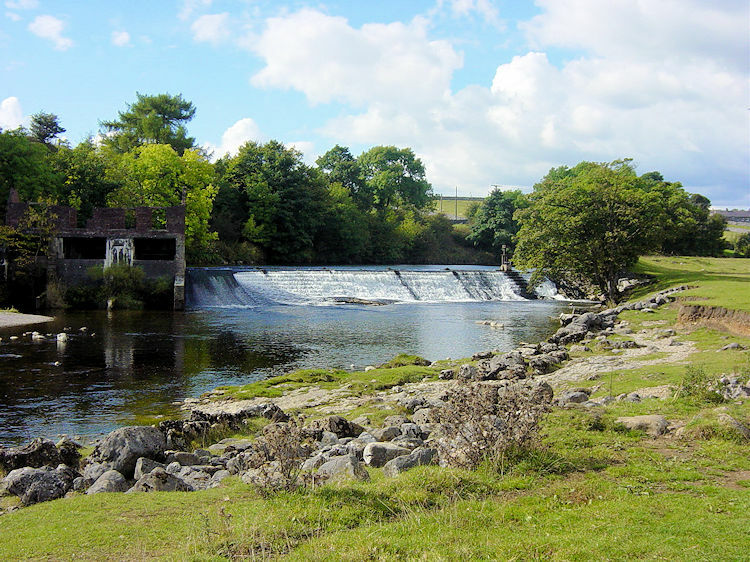 After passing round the fringe of Grassington where Ally and Deke were conned out of a tea and scones break by Jez we dropped down to the River Wharfe at Threshfield. We followed the river on its course downstream to Linton Falls where we crossed over to the southern bank via a wooden bridge. We were in tourist country now and scrambled through the crowds before walking through Linton village and Linton Churchyard to a stepping stone crossing of the river which we all made. From Linton we walked along the riverside amid Horse Chestnut trees where we got into a discussion on whether conkers float or sink. Dave was convinced they floated, Jez and I convinced they sank and so he threw a couple in and said there they are floating away. We couldn't see them so rustled through the fallen leaves to find one. We couldn't so Deke obliged by throwing up a stick and knocking one off a tree. When we got to Hebden Suspension Bridge I conducted an experiment by dropping the conker gently into calmer waters of the river. It sunk like a stone. Point proven. 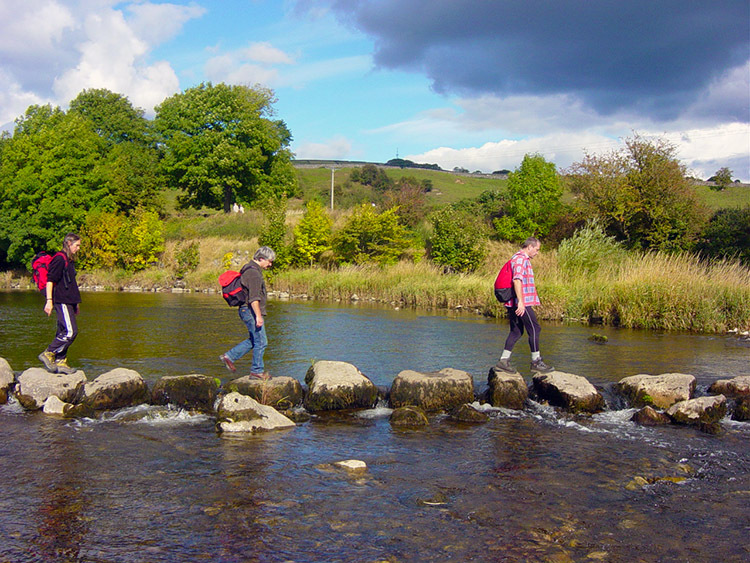 We then all crossed over the river to return straight back again by way of a second set of stepping stones. Cue posers picture above right. Then it was a simple short walk back to Hebden.